Public holidays in Syria consist of a variety of cultural, nationalistic, and religious holidays. The primary national holiday in Syria is the Evacuation Day, celebrated on the 17th of April of every year, which celebrates the evacuation of the last French troops in Syria, officially ending the French Mandate for Syria. 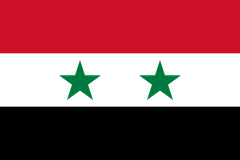 Other important holidays include the anniversary of the October War on the 6th of October, Martyr's day on the 6th of May commemorating the execution of many Syrian nationalists by the Ottomans, and Armed Forces Day on the first of August celebrating the creation of the Syrian Armed Forces.